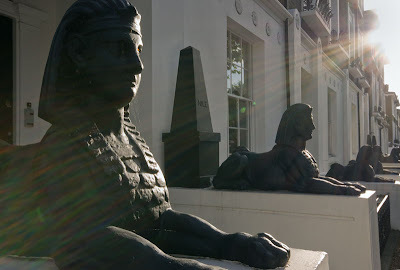 In Islington this street of town houses dating from the early 1800's are gusrded by sphinxes and obelisks with Nile written on them. Why? Who lives here? It's still a mystery to me. However I did find some reference to the fact that so proud were the English of Nelson's victory of the Nile in 1798, that for years after Egyptian decor was very 'in'. The streets popularity continues. Even the Blairs lived here for sometime. Could it be Al Fayed living there? Interesting - which street is this. I lived in Islington for a while but obvioulsy missed this. Fascinating fact and the homes looks so elegant too. But everything pales in comparison to the light in your photo! Love that rainbow. Odd but elegant. You always find the way the surprise us, Mo! The light in the image is spectacular. It is really the light that stars, not the statuary guarding the entrances. I'm heading to Egypt in October -- so happy Lord Nelson won't be duking it out for supremacy then. Isn't there a bit of this in Belgravia? Maybe my memory is wrong. Can you give me the location about this street. I want to go their. great composition and the sun coming in from the corner is beautiful. This is beyond cool! I had no idea about this. It's for sure going on my list of "Must See" things next time I'm in London. This is a wonderful shot! The sun rays couldn't fit more! Great work, Mo!